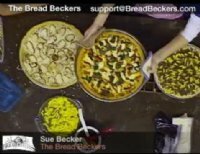 Sue Becker demonstrates how to make the "Perfect Pizza"
The products shown in the video are listed below, and are generally in the order as presented in class. When you see a product in the video that you'd like to buy, simply input the quantity you'd like. You can add them all to your cart at any time!